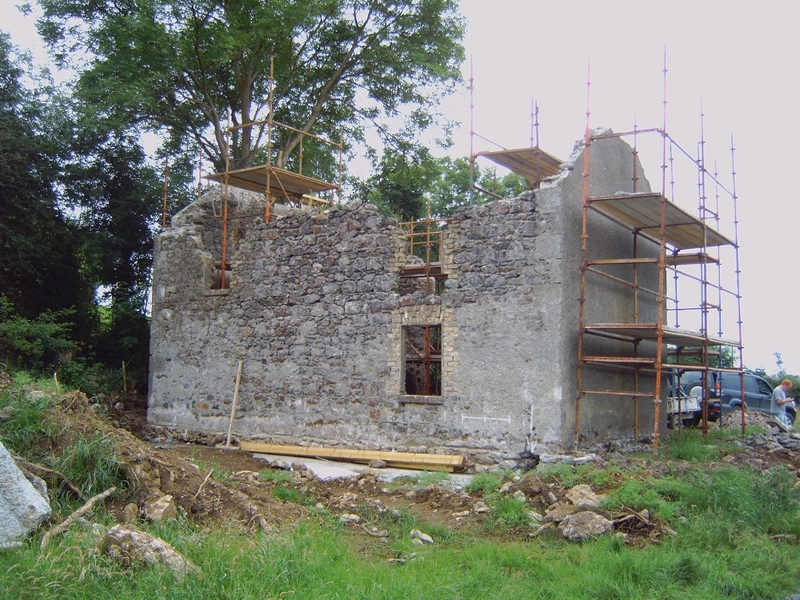 Farmhouse Conservation and Extension | Mathieu & Mitchell Ltd.
All that remained of this two storey farmhouse was four ivy clad walls in a serious state of disrepair. The roof had been removed a number of years earlier which meant that the walls were continually saturated and the freeze / thaw process had caused a lot of damage to the top of the walls and especially to the gables and chimneys. Luckily the house was situated on a dry self draining site which meant that the foundations and base of the walls were in good condition. The shrubs and ivy were carefully removed by hand during the winter months so as not to interfere with the bird nesting season. 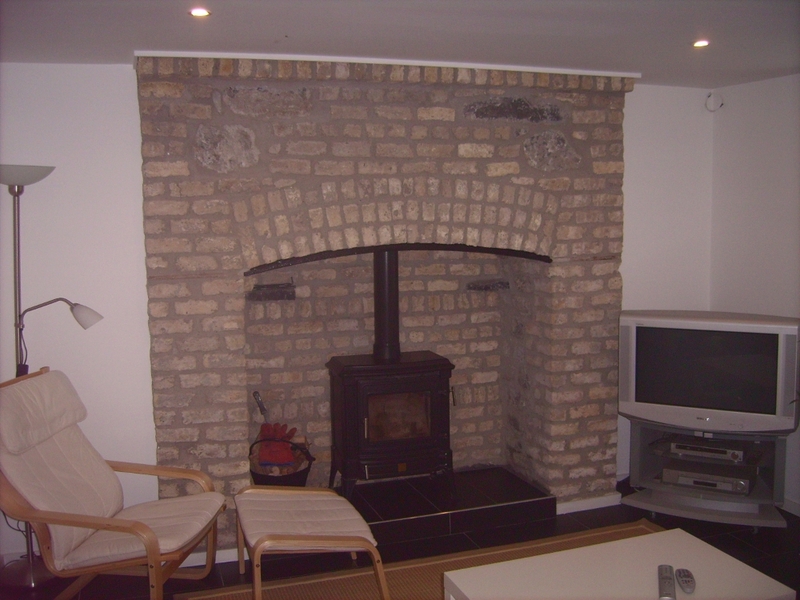 All external openings and chimneys were rebuilt using the original brick and lime mortar. 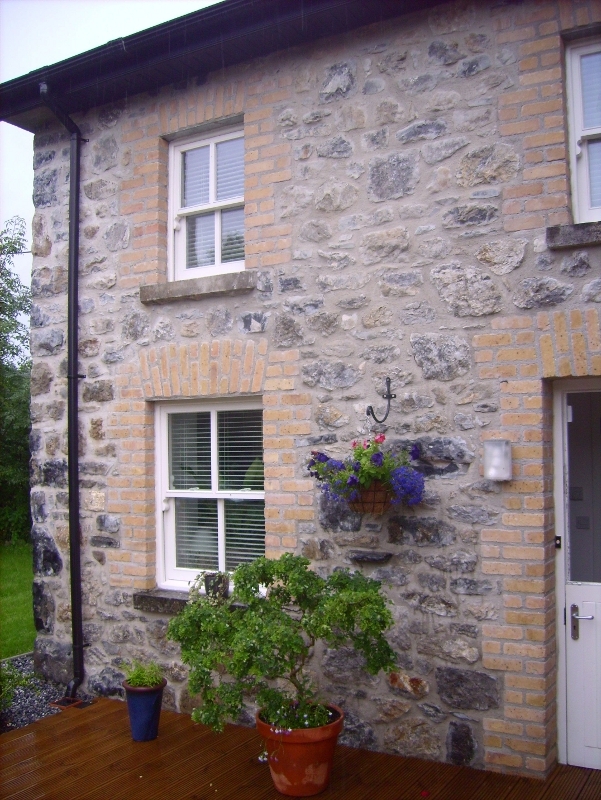 During the conservation works provision was made for the construction of a front porch and rear extension which we carried out the following year. 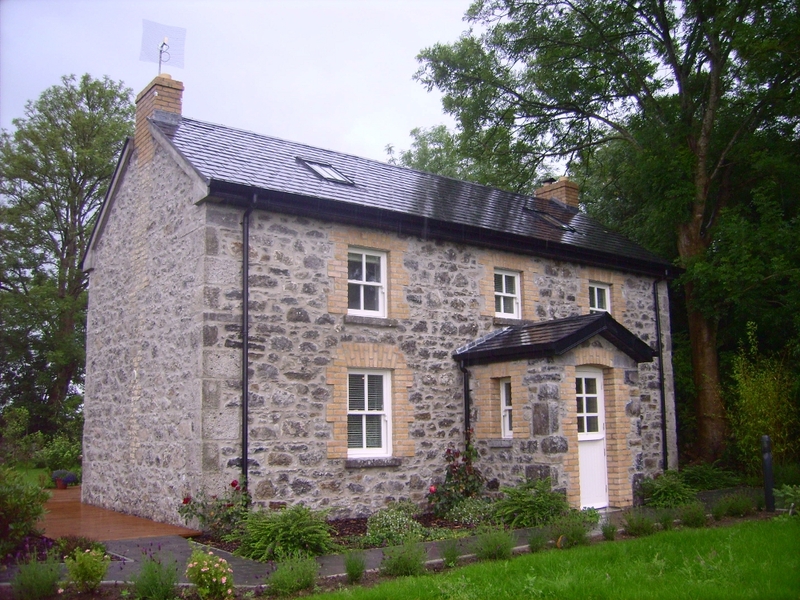 The building was re-roofed using natural slates and a breathable felt. Roof lights were also fitted to increase the amount of natural light in the upstairs. Re-pointing externally was carried out using a lime mortar. 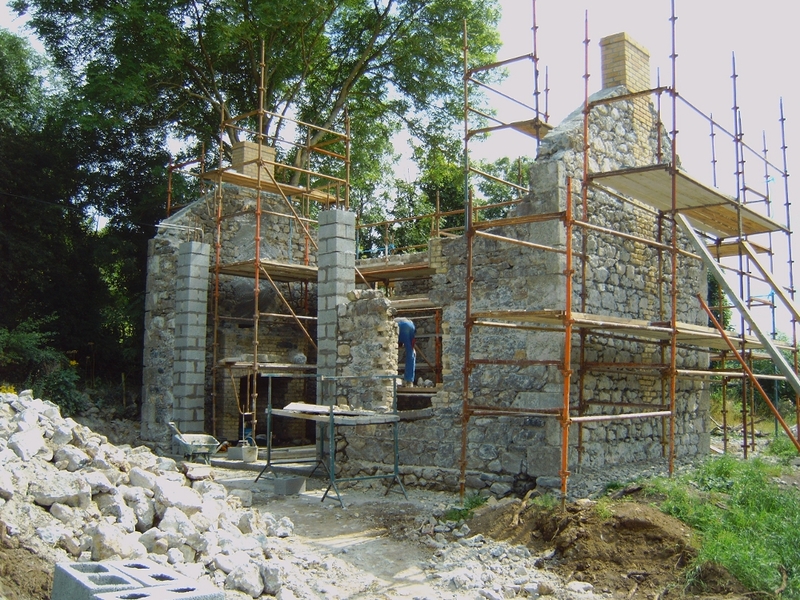 As the joints in the stone work had been deeply eroded gallets or pinning’s had to be inserted to keep the joints to a minimum. The mix for this first stage of the re-pointing was made up of 3 parts NHL 3.5 (St. Astier) / 3 parts 5mm Wexford Beach Sand and 2 parts 5-10mm Wexford Beach Pebble. This coarse mortar gave a good strong joint for the next layers of re pointing which consisted of I part NHL 3.5 to 2 Parts clean sharp sand. 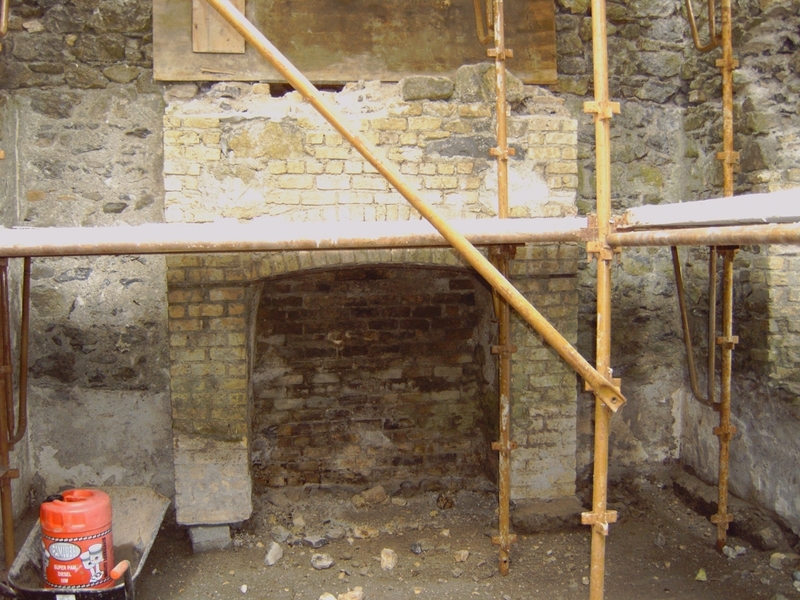 The work had to be carried out in three stages, with a two week gap between stages in order to allow carbonisation of the lime mortar to occur. A slightly weaker mix using NHL 2.5 was used on the internal re pointing in order to increase the breathability of the walls. Great credit must be given to the owners for saving this structure and turning it into a beautiful home. 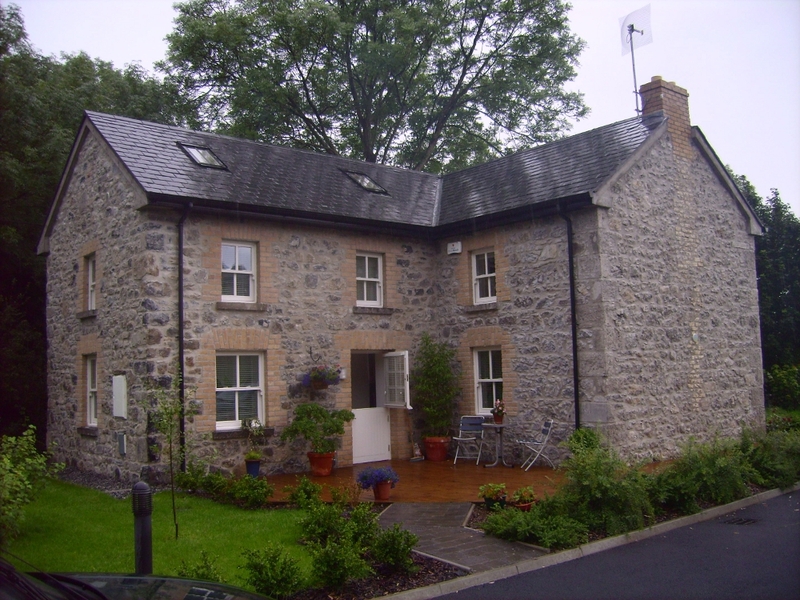 The natural slate roof, two brick chimneys and lime re pointing internally and externally help the building blend in with its surroundings. The before and after pictures speak for themselves. If you have and old structure try and keep some kind of a roof on it even if this means using cheap agricultural roof cladding and guttering. Board up the windows to keep out the rain but don’t forget to leave a few small holes in the plywood to provide ventilation and prevent dry root. A French Drain installed around the base of the building will keep the foundations dry and divert ground water away from the building. Make sure the rain water from the roof is also properly disposed of. These simple measures should conserve the building and prevent further costly damage.